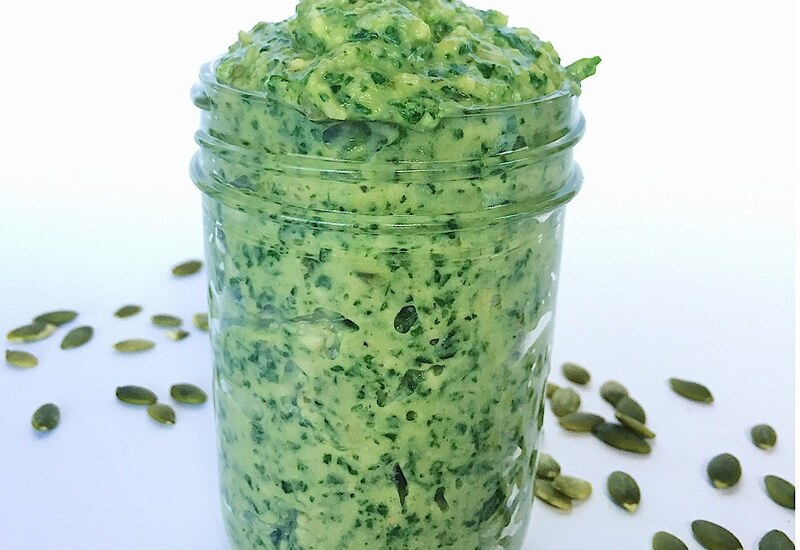 If you're vegan or dairy-free but craving pesto, this is the recipe for you. This easy, healthy sauce uses white beans instead of the traditional Parmesan cheese, and the result is so packed with flavor that you'll never miss it. Tons of fresh basil, toasted pumpkin seeds, garlic and olive oil round out the sauce, and lemon juice adds a pop of brightness—and unlike regular pesto, it's low-fat and is filled with fiber thanks to the beans. Serve the pesto on everything from pasta to zoodles, as part of a grain bowl, or even on scrambled tofu for breakfast. Using a high-speed blender will give you the smoothest texture, but if you don't have one or prefer your pesto a little chunky, a food processor or immersion blender will also work well. The pesto can be refrigerated for up to one week, or stored in the freezer for up to a month. Per Serving: 122 calories; 8g fat; 10.7g carbohydrates; 4g protein; 0mg cholesterol; 180mg sodium. so genius to use white beans instead of parmesan to make this creamy, basil pesto. i used it as a dip, but i think you could thin it out with a few splashes of water to make it a pasta sauce. I really liked the texture of this pesto, it was delicious. The white beans were perfect for adding creamy texture. I also loved the garlicky flavors, so yummy.